Our town is your town. Let’s work together to build Jersey UP! In an effort to support growth and revitalization of Jerseyville’s business district, Jersey State Bank has developed a program to stimulate the purchase and renovation of commercial properties. Flexible loan terms and options tailored to your needs. Whitworth-Horn-Goetten would like to thank Jersey State Bank and their staff for all the time and dedication they put in to our rehabilitation project. Renovating a 115 year old building is no easy task and has many challenges. 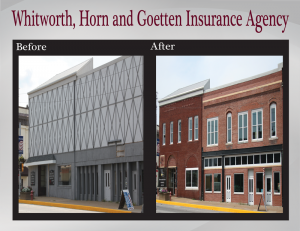 Steve Goetten and Mark Schaefer worked with us to develop a finance plan that allowed us to renovate our historic building while feeling comfortable with our investment. When you work with their experienced loan staff you feel like you and your business really matter to them. We always enjoy coming into the bank or having them stop by our office just to say ‘Hi’. It is great to have people you feel comfortable talking to about your business. Jersey State Bank has grown a great program with Jersey UP. Their enthusiasm and willingness to stimulate growth in Jerseyville’s business district affirms their commitment to our community and the preservation of downtown. We would like to extend a most heartfelt “Thanks” to Steve Goetten and Jersey State Bank, without whom this project would not have been possible. From its inception, they eagerly brainstormed with us, excited as we were to be part of the first downtown TIF project. 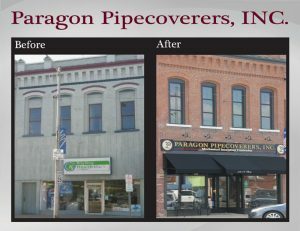 Together, we arrived at a workable finance plan that allowed us the ability to budget ALL that was needed to bring this tired building back to life. JSB allowed us creative reign over the ideas that WE could “see”, and visited often to share in our progress and offer their encouragement every step of the way. Renovating a space that is over 135 years old presents definite challenges… but thanks to the staff at Jersey State Bank, financing was not ever one. They are truly compassionate about the growth and success of our downtown area… our project is proof!